A view on how Millennials are disrupting the business world and what sectors should urgently reinvent themselves. There’s an interesting equation in business that’s composed by two values: Purpose and Profit. Up until the advent of a new generation called Millennials, both factors combined would represent a paradox or pure business nonsense. But Millennials grew up to became unsurpassable opinion makers and the predominant part of the current workforce. That was when the word Disruption gained a whole new meaning. Let’s step back a little to try to understand why Millennials do this ( I believe I’m legitimized to explain it since according to some studies I’m still a Millennial :)). Firstly, they don’t really know why they are doing it. They just do it. It’s like they’re Stormtroopers instructed to turn the old standards upside down. Mission accomplished, soldiers! Secondly, they were raised by a generation of parents that, out of good will and heart, believed that love meant material gifts and immediate reward for whatever reason. Most of those parents went through hell and back to achieve financial stability, so they didn’t want their kids to go through the same hardships, which is perfectly understandable. And if on one hand parents were using their life’s savings to buy an 18-year old a brand new car, on the other they forgot to elucidate that same kid how much it took to get there. So Millennials grew up believing they were very special, smarter than anybody else and that the whole world was in their reach. The amazing thing about it is that they don’t take no for an answer and they’ve erased “impossible” from their dictionaries. The unfortunate outcome was that they became immature and fragile adults with low levels of tolerance and resilience. World-renowned neuroscientist Richie Davidson explains the top 4 scientific factors that shape well-being and guess what’s one of them?! Yep! Resilience. This leads us to our Third reason behind Millennials’ behavior: they are not happy. However, unlike their also unhappy parents, they are trying to turn that around. This is when Profit and Purpose equation jumps back into our story. Millennials saw what a money driven life did to their parents and they refuse to accept they are doomed to a 50-hour-work-week-slavery. Materialism emptied their homes of love and connection (hence the huge divorce rates) and placed 5 bedroom beach houses or the latest iPhones as the centerpiece of a human existence. Clearly not fulfilling enough, right? So what’s next?! PURPOSE. I am not saying that profit / money and purpose are incompatible. I am just saying that the first factor can no longer survive without the second. So companies better watch out for this crucial component of Millennials decision taking process and start reevaluating how they do business, recruit, retain, develop their products, manufacture their merchandise, utilize energy resources or care about customer’s feedback, because everything will soon be scrutinized via online monocle. At the same time exponential technology wipes away old linear systems of innovation growth so is human consciousness evolution pushing for a faster shift in the way we do business today and in the future. If you pay close attention you will notice the signs: how fast health and wellbeing concerns are spreading in every social media, how spirituality is mainstreaming, how social causes are grabbing the attention of millions, how alternative education models have become so popular, how diversity became so relevant to organizations…I could go on and on. Tobacco and Alcohol: They are already many signs out there that show that these industries are not doing well, hence the electronic cigarettes. In a near future, the general public will not legitimate these evident attacks to human health. Fast-food, Refrigerators and Processed mass consumer products: More and more studies show that sugar is a “legal drug” that’s at the origin of many diseases and that processed food is harmful to our health and wellbeing. In 30 years I believe our kids will mock us by having allowed candy or Big Macs to be near them (just like smoking was allowed not long ago). Healthcare, Pharmaceutical and Health Insurance companies: Studies show the increasing success of the use of placebo in curing patients even when patients know it’s placebo. Interesting, right?! If there are psychosomatic diseases why can’t there be self-healing?! At the same time there’s a growing demand for natural products such as herbal syrups or teas. Although I value conventional medicine in extreme or urgent cases I believe that the paradigm is shifting from cure to prevention, through good food and healthy living. Furthermore, Technology will help us immensely by increasing the reliability and speediness of diagnosis methods (just watch the new Star Trek movie ;)) and by showing us how to properly use the old knowledge on plants without harming us with one hundred side effects. Therefore, Healthcare, Pharmaceutical and Health Insurance companies will need to start thinking about how to accommodate these trends into their business models. Big consultancy firms : Many of them (not all) impose a hectic lifestyle by which their employees work around the clock, all dressed in grey and discuss theoretical approaches to issues they have never experienced but were empowered to solve. Their “one-size-fits-all-look-good-on-paper” services are inexplicably expensive, with low value for the customer. Innovation stagnation is also a reality probably due to crazy sales targets that prevent them to observe new business challenges and adjust to them. 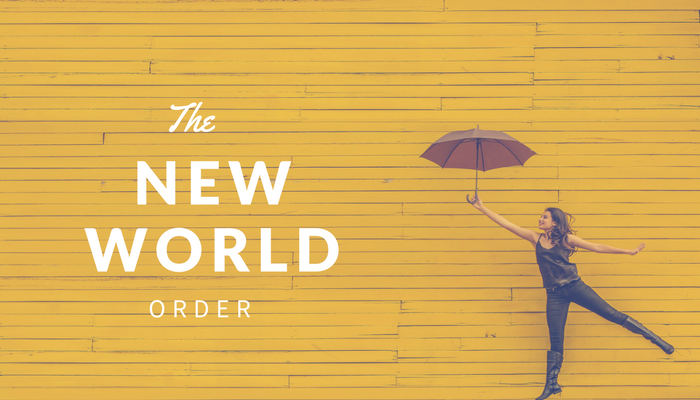 This new world will have less and less room for purposeless jobs or unclear customer services. Advertising companies: If there’s a sector that puzzles me is this one. Creativity means freedom to me. Freedom to be, to do and to make allow others to be and do as well so that together we can make this world a bit more beautiful. But in many (too many!) advertising companies there’s a clear slavery system going on, by which people are completely disposable and big egos tear apart anything that crosses their stages. Democratization of open source tools — just look at Canva — and new working models such as digital nomads or freelancing platforms, will also push this model to change. All in all and across all businesses, there are clear signs of change that are causing old foundations to shake. This new world order that’s arising will surely encompass new values such as democratization, sustainability , transparency, connection and of course purpose, that fundamental something that makes us want the “leave this world a little better than (we) found it”. Sharing my Journey of Humanity. From Entrepreneurship to Spirituality all written with Love, Humour and No Bullsh*t.